I’ve heard it said that Puerto de la Cruz in the north of Tenerife is a quiet, traditional town favoured by elderley Brit and German holidaymakers who choose the resort for their holidays on Tenerife. In fact, for some regular visitors to TripAdvisor, that image is promoted as a selling point. But in reality, Puerto is probably the most misrepresented resort on Tenerife. You see, it just doesn’t fit the mould of other popular Tenerife resorts. For one thing, its character is essentially Tinerfeñan. Although the first resort on the island and the victim of mass tourism development in the 1960s and 1970s, the town has never given up its identity to fit in with tourist expectations. The vast majority of its almost 32,000 population are Tinerfeñan, Canarian or Spanish and they live, work and play in the town year-round. Nightlife in Puerto doesn’t fit the mould of other Tenerife resorts either. Conspicuous by their absence are cabaret bars (with the notable exception of the excellent and hilarious Bitter & Twisted), tribute bands and Karaoke bars. Absent too are über-stylish lounge bars where the beautiful people gather to pay extortionate prices for their vodka and Red Bull. Instead, Puerto prefers to conduct its social life the same way it does its family life – in the community; sitting at one of the tables beside the harbour or in one of the squares people-watching over a carafe of wine; chatting in a local bar with a glass of vino del pais and shots of brandy; open air concerts, fiestas and entertainment at the harbour and dancing in night clubs that don’t open until midnight and unless you knew where they were, you would probably never find them. But more than anything else, the thing that separates Puerto from other Tenerife resorts is that it’s at its very liveliest in summer when Spanish mainlanders and Canarios descend on the town in their droves to enjoy a non-stop party. Beaches become a busy playground of brightly coloured sun umbrellas at the water’s edge; the harbour, streets and squares buzz day and night with holiday makers strolling with ice creams, candy-floss and almendras; tapas restaurants fill the streets with candlelit tables and the night air with irresistible aromas and there’s barely a Brit or a German to be seen. Puerto de la Cruz – about as sleepy as a convention of insomniacs. Walking the streets of Puerto de la Cruz around midnight last night, you’d have been forgiven for wondering if some giant, flesh-eating plants had invaded the town leaving the streets bereft of its citizens. But there’d be two vital pieces of information you’d be missing. 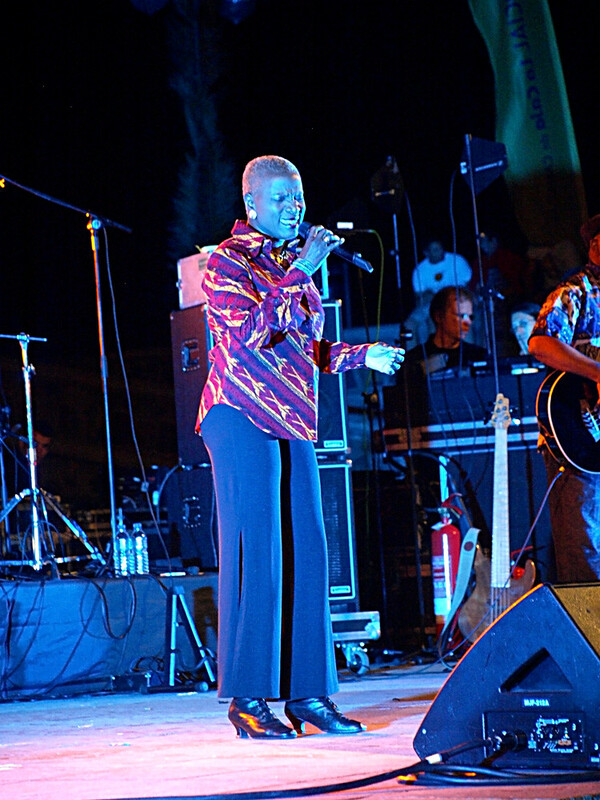 Firstly, much of the population were nursing the hangover from hell after a full day of partying at the Fiestas Del Carmen on Tuesday and secondly, those who were still capable of dancing were all being held hostage at Plaza Europa by a diminutive African woman named Angélique Kidjo. Bitching about the fact that there was no break between fiestas at this time of year and sounding like Victor Meldrew in knickers, I headed down to town at around 9pm for the opening night of the annual Jazz & Mas concerts. Arriving in Plaza Europa, some hundred or so chairs were laid out theatre-style, most of them already occupied. The stage was set outside the Ayuntamiento (Town Hall) building, lined by bright green kiosks enticing us to piensa en verde (think green) and beyond the stage large Heineken banners fluttered in the sea breeze like prayer flags calling the faithful to imbibe. Jack and I positioned ourselves standing a metre or so behind the chairs, so that we could easily access side of stage for photos, and berated the use of staid seating for a concert as we watched a more mature crowd jostle for spare chairs. 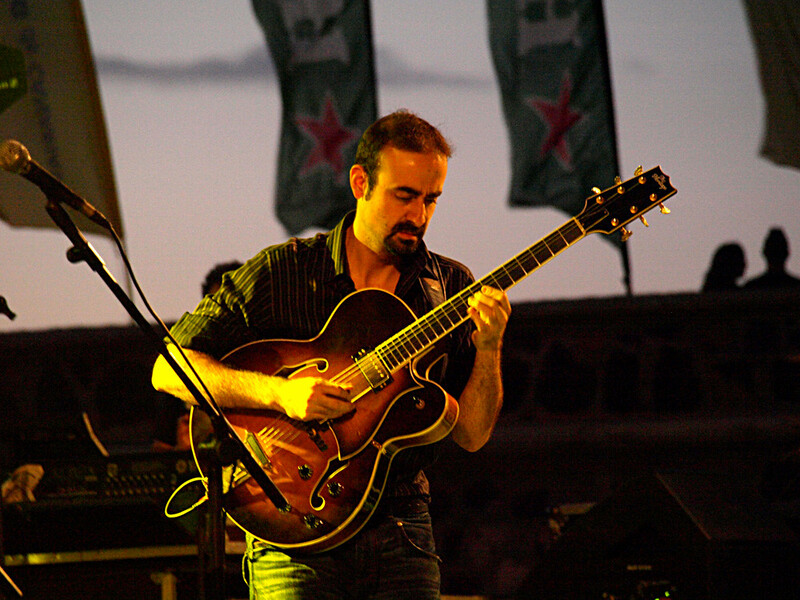 First up was celebrated local(ish) lad, Yul Ballesteros, fresh from the New York modern Jazz scene. Born in Gran Canaria, this young man has been wowing New York with his guitar prowess and last night, it was easy to hear why. His improvised style may not be everyone’s first choice of easy listening but he certainly pleased the jazz aficionado audience last night. His set lasted for over an hour and had Jack and I doing a U-turn on our earlier diss’ of the seating arrangements as our backs, still exhausted from Tuesday, began to register painful indignation at this abuse. Feeling slightly guilty, I didn’t join in with the random cries of Otra when Yul and his quartet left the stage. Muttering to each other about only staying to watch a bit of the next performance, we watched a small African woman with close-cropped grey hair; flared loons split from the knee down and ankle boots, take to the stage. Unaccompanied, she split the night with a voice so powerful and sweet that it brought tears to the eyes. She sang her song in Swahili, keeping time with a soft rhythmic tapping on her thigh; this tiny figure on a huge stage which she filled with her presence. In an instant, she had captured the 500 strong audience and held them in her thrall. She ended her song to tumultuous applause and immediately went into a fast tempo African number, a fusion of funk and soul to the beat of African drums, her body gyrating and stomping in a dance display of pure vitality and joy. That was it. The onlookers from the back surged forward to surround the seating area, dancing like they’d just discovered how good it was. Soon the ranks broke again and a tide of dancing bodies swept to front of stage as Angélique lifted every single individual up and sent their spirits soaring through the night. The fact that she spoke entirely in English, most of which would have been lost on them, did nothing to diminish Angélique’s hold on her audience as she told us about how her father had introduced his children to the world by bringing them music from all the places he could never afford to send them to; Europe, America, India – musical influences that she now melted and fused with her native African beats to produce her high energy, compelling songs. Our broken backs now forgotten, we watched, sang, danced and laughed as Angélique held us hostage late into the night. By the time we left, a good percentage of the audience were up on stage with this incredible woman, helping her to celebrate her fiftieth birthday by dancing to the drums of her childhood which echoed through the empty streets and followed us all the way back to the car. If you ever get a chance to go and see Angélique Kidjo – do it. It’s not just a concert, it’s a life-affirming experience. 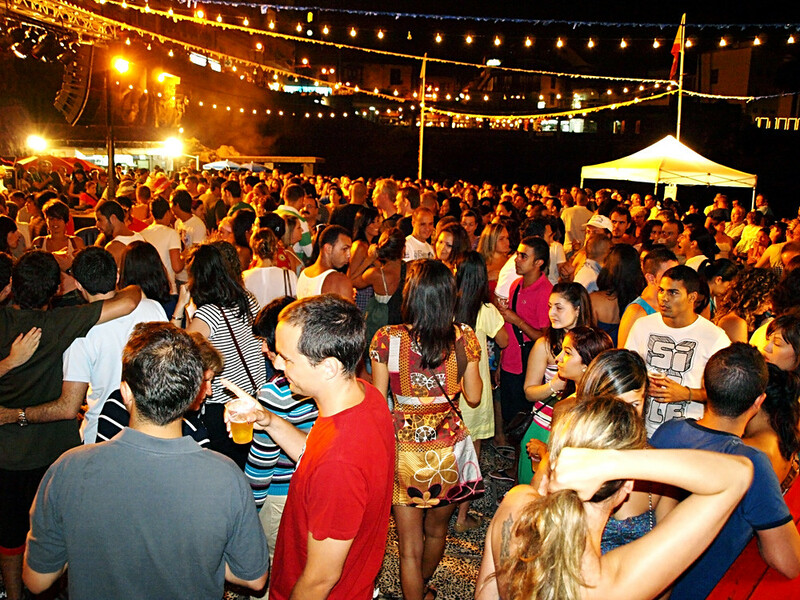 It’s a well known fact that the nightlife centre of Tenerife is Playa de Las Américas…or is it? Well, as far as many of the people who holiday on Tenerife year after year are concerned it certainly is. The area known locally as ‘The Patch’ is choc-a-bloc with live venues staging tribute bands, comedy acts, drag shows and karaoke. Now reduced to a small area but just as popular as ever with the young contingent, the area of Veronicas and Starcos is where a heady, hedonistic cocktail of top sounds, cheap drinks and exposed ‘white bits’ plays out nightly. And for those with a more sophisticated entertainment palette, Costa Adeje provides chic venues such as El Faro Chill Art where your wallet might feel like it’s been mugged, but it’ll enjoy the experience. Interestingly, what many of Tenerife’s millions of visitors rarely discover is that there’s another world of nightlife in the north of the island, one whose nightclubs are packed to the rafters every summer weekend with locals and holidaying mainlanders. In the capital city of Santa Cruz and the charismatic harbour town of Puerto de la Cruz, the nightlife is only just beginning as many of the south coast holiday makers are wending their way back to their hotel beds. Discos pump out Latino, Reggaeton and Salsa intermingled with top UK and US dance, Indie and chart sounds until the first churros of the day emerge crisp and fragrant from the fryer at 6am, ready to be doused in sugar and dipped in hot chocolate by the tired clubbers on their way home to bed. And as the days grow longer and the evenings grow warmer, both Puerto de la Cruz and Santa Cruz stage street festivals of top notch live music to modest audiences who enjoy the entertainment for free. 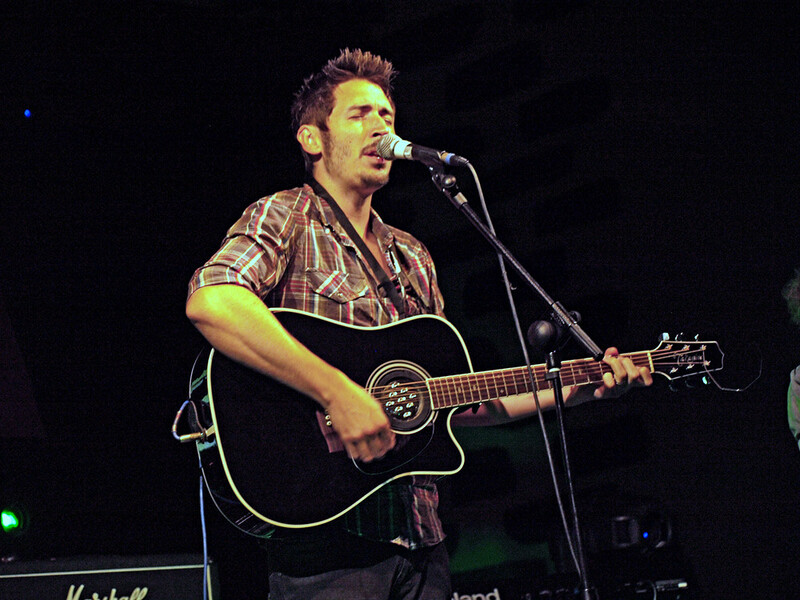 Last month alone audiences were treated to a European Music day in Puerto which included the extremely talented singer/songwriter from Tasmania via Madrid – Aaron Thomas. 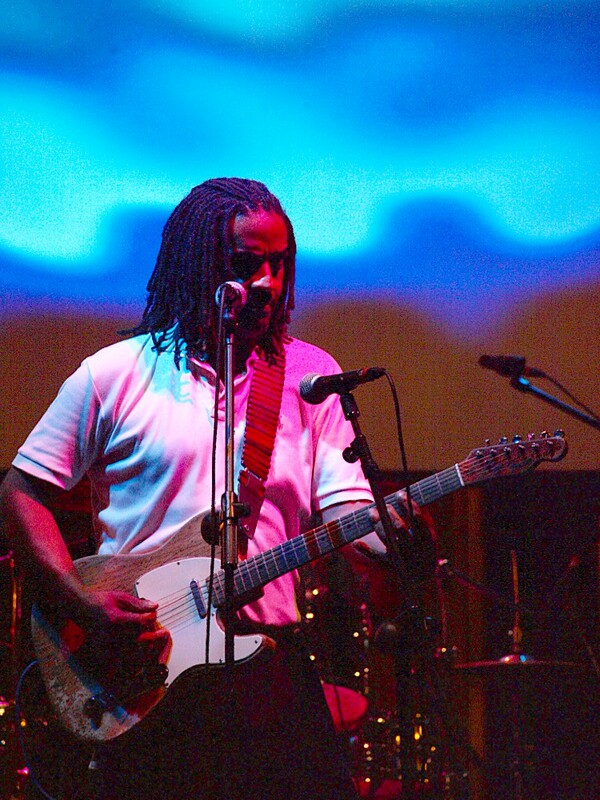 And in Santa Cruz the fabulous Annual Blues Festival of Santa Blues saw audiences enthralled by the likes of Larry McCray and Kenny Neal. 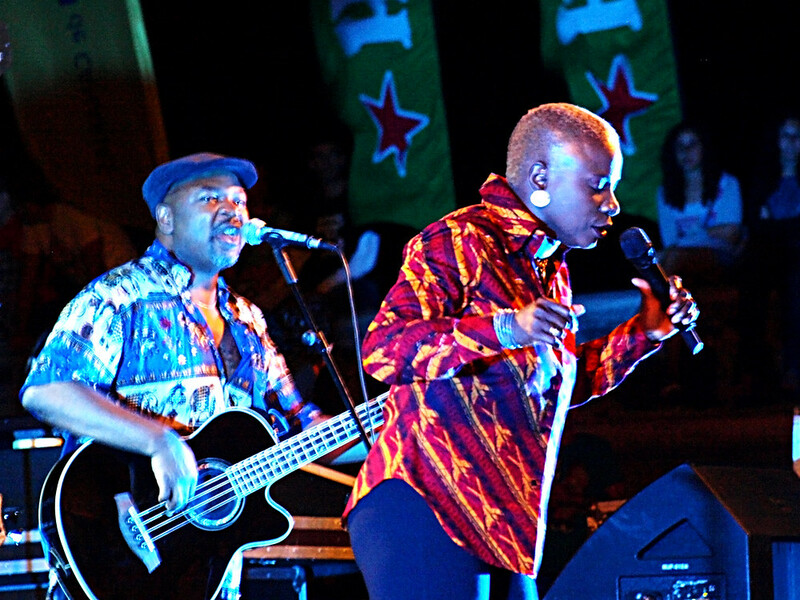 This month the extremely popular Heineken Jazz y Mas festival hosts concerts across venues in Santa Cruz and Puerto de la Cruz between the 8th and the 18th July and features ten concerts from traditional, through modern and improvised Jazz to a Billie Holiday tribute night and the amazing African singer Angélique Kidjo. So, the nightlife centre of Tenerife is Playa de Las Américas…? Well, let’s just say it’s one of the places where you can enjoy good music this summer.